I had heard about the place," Chris Chandler recalls of his first Memphis gig at the Map Room in the spring of 1997. "So, I just pulled up and went in, and with no PA or anything, took out my guitar and started playing." If that's the case, he's lucky he wasn't arrested. Even for the normally anything-different-goes atmosphere of the Map Room, Chandler stands out. His odd, punk-like appearance — lean, shaven head, jeans, and a T-shirt — pretty well represents his act, an intriguing combination of satirical, angry poetry (usually attacking the growing generic-ification of American culture) read to folk-music accompaniment. Folken word, as Chandler calls it. "Obviously I'm influenced some by the Beats ­ Kerouac, Ginsberg, and those guys," Chandler says of his inspirations. "But I don't want to be called the next Ferlinghetti or even the next Maggie Estep." His performances have won him accolades in both music and poetry circles, including readers' Spoken Word Act of the Year award and critics' Acoustic Act of the Year award in the Atlanta newspaper Creative Loafing's 1996 "Best of " issue. A native of Stone Mountain, Georgia, Chandler was running lights for the Atlanta band the Georgia Satellites when he met his mentor and collaborator, writer and tarot card master Phil Rockstroh. "Phil had just moved back to Atlanta from L.A., where he had been writing sitcoms," Chandler recalls of their first meeting. "There was a woman involved. I think we were both vying for the same woman that neither one of us ended up with, but we just became good friends." And their friendship grew into a collaboration. Since meeting, the two have written a book of poetry together — Protection From All This Safety (and other tales of love, death, and laundry), published last year by Portal Press — as well as the words to all 10 of Chandler's self-released tapes (each dubbed on a boom-box recorder) and his three official indie-label releases: As Seen On No Television, Generica, and the recently released Convenience Store Troubadours, which features appearances by artists such as David Roe, Samantha Parton, and Chandler's old boss from the Georgia Satellites, guitarist Dan Bern. Simplified, their partnership boils down to a combination of Rockstroh's substance, his "ability to nail a topic," and Chandler's style, his "infectious sense of humor and style of speaking." Until recently, however, their work together has been peripatetic for Chandler. From 1988 until just this year, Chandler was constantly touring the continent, living out of the back of a series of trucks and vans ("I highly recommend the Chevy truck; I put 260,000 miles on that thing," he says. "I don't recommend the VW micro-bus for heavy traveling. One day the engine fell out on me in the middle of the road.") His travels took him from Edmonton, Alberta, to Guadalajara, Mexico, from Halifax, Nova Scotia, to Baja, California, with stops at every coffee shop and folk festival in between. Chandler recently gave up life on the road for an address in New Orleans. And while he may not be there all the time, home life has apparently had a domesticating effect on Chandler. His music was once little more than him strumming a guitar, but now he has made it more accessible by adding a four-piece band. 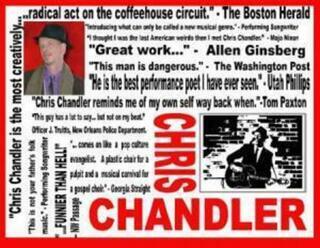 "It's sort of collages with poetry over folk music with funky backbeat," Chandler says of his new sound. In addition, he has toned down the ranting, confrontational aspects of his shows and taken a more thoughtful approach. "I have gotten away from the confrontational thing in favor of something more spiritual," he says. "I think [Phil and I] are coming up with stuff that is very timeless. Stuff that deals with the body politic and the personal politic and not just the political. In the past I was known for doing very timely, topical work. But now I'm interested in the everyday experiences of life more than anything else."